Katrina Clokie will be running a workshop on three styles of automation at Let's Test. The 3 styles use different test runners and have different patterns of using WebDriver. With one of the styles using Concordion to drive the tests, I'd like to suggest a few areas for improvement with the Concordion specification while retaining the original feel. (Katrina has acknowledged that the Concordion suite is using a traditional approach). I view the assertTrue command in Concordion as a "spec smell" ("a surface indication that usually corresponds to a deeper problem in the system" ). At the very least, assertTrue should be used sparingly since it only displays true or false on failure, which necessitates additional debugging whenever an issue occurs. As described in Seeing the wood and some trees, including both the acceptance criteria and some examples helps us discover gaps and gain a deeper understanding of the requirements. 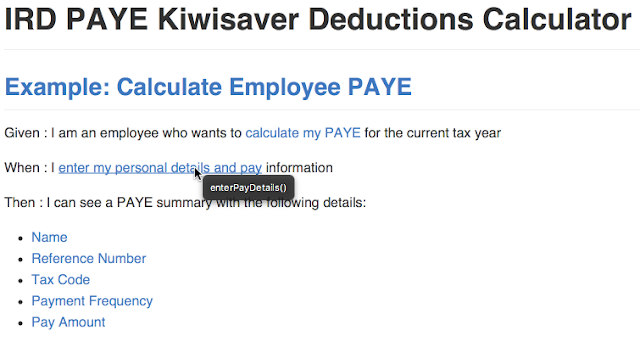 The IRD PAYE specification above is documenting the acceptance criterion as an example which, in my view, is too high-level for an example. By omitting the concrete details of the example, we fail to ask the "what-if" questions which limits our discovery of additional interesting examples. 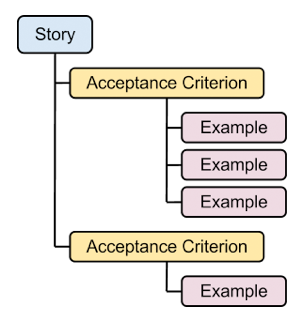 Writing the specification as follows, pulls the test up to be an acceptance criteria and shows the concrete example. This also removes the assertTrue spec smell. Note that we still only show relevant details, eg. 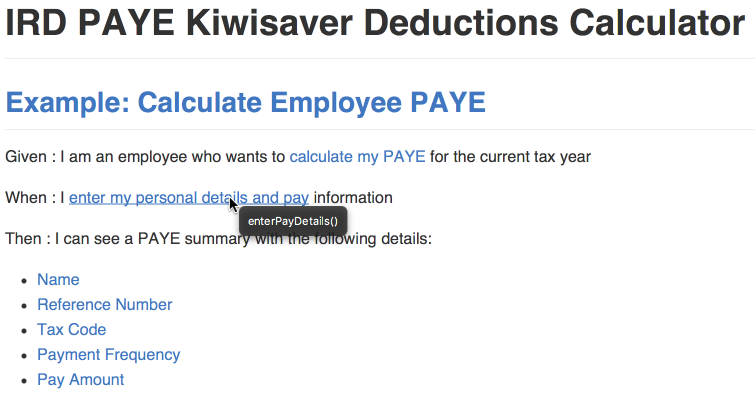 user type and tax year are not relevant so are handled in the fixture. Seeing this example, I start questioning "what-if" about the comma in the input amount field? Do we need it? If used, should it be restricted to separate groups of three digits? Or might our Indian customers want to express in Crores and Lakhs, for example "1,00,00,000"? The refactored specification is smaller, easier to read and write with fewer errors. Any failures of the test now clearly display the actual and expected values on failure. By cleaning up the specification, we have discovered other acceptance criteria that may be worth exploring, such as the placement of the comma in the input amount. Other improvements could still be made to the specification, such as rewording the Given-When-Then to make it less clunky. The updated code is available on Github. Oh how I love the Groovy! While most jar files have the version number in either the Bundle-Version or Implementation-Version attributes of the MANIFEST.MF file, some do not follow this convention, and we need to either look for a file ending in _VERSION, or parse a pom.xml within a META-INF subfolder to get the version number. Groovy makes it so easy to do this stuff. On top of this, creating the HTML table is a breeze. The icing on the cake is to save the file and open in Firefox in a couple of lines. This would have taken hundreds of lines in Java. Groovy makes it concise, while allowing access to all Java libraries, resulting in code that is readable (if a little alien at first) to a Java developer. I'm pleased to announce that concordion-extensions is now a sub-project of Concordion. This project includes extensions to add screenshots and logging information to Concordion output, and to change the format of the timestamp in the footer. See http://concordion.org/Extensions.html for further details. An updated release, concordion-extensions v1.0.1, is now also available in Maven central. See http://concordion.org/Download.html for details. The classes have been repackaged under org.concordion.ext. Any users of concordion-extensions v1.0.0 will need to update their package definitions with this new release. If anyone has ideas for additional extensions, please discuss them on the Concordion mailing list. add them to http://code.google.com/p/concordion-extensions/wiki/ExtensionIdeas. Oct 26, 2014. These extensions are now packaged as individual projects and hosted on Github. See http://concordion.org/Extensions.html for details. When running GUI tests it can be difficult to determine what was being shown on the GUI at the point of failure, especially if the tests are running minimised or on a CI server. We developed a screenshot extension for Concordion to include screenshots in the output whenever failures occur. We've been finding this extension incredibly useful for diagnosing intermittent failures in our automated acceptance tests. This requires the new Concordion 1.4.1, which introduces support for extensions. Amongst other things, extensions can add new listeners to commands and make changes to the Concordion output. 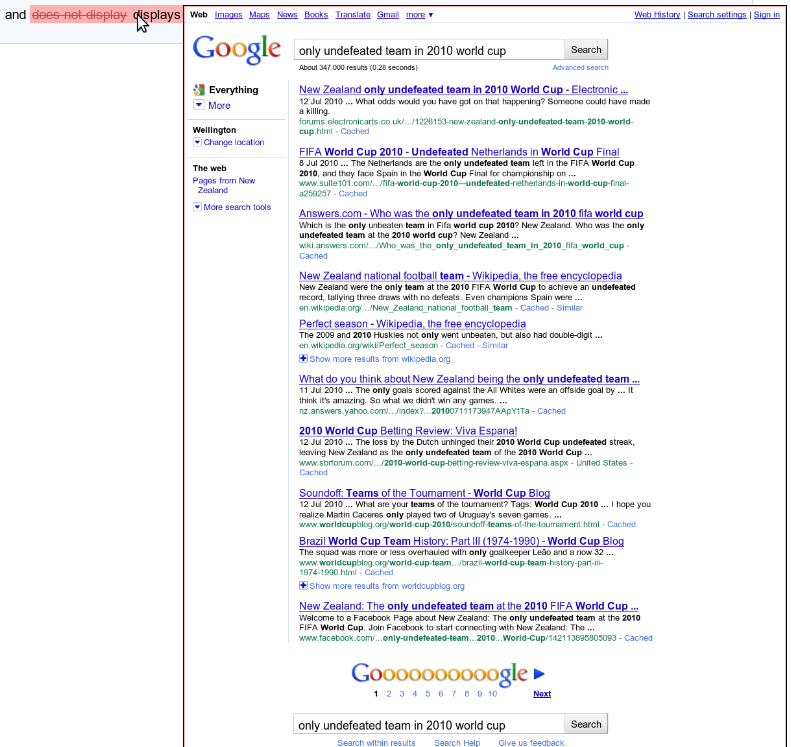 The following example is running an end-to-end test using WebDriver (Selenium 2) to test a Google search through the Firefox browser. 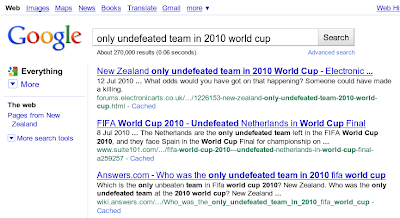 While the results show that the test is failing since Netherlands is displayed in the Google results, it would be helpful to see the actual results page. The screenshot extension allows us to hover over the failure to see an image of the browser page at the time the failure occurred. In this example, we've configured the extension to use WebDriver's TakesScreenshot interface, so we see an image of just the browser page, irrespective of whether it is currently visible on the screen. 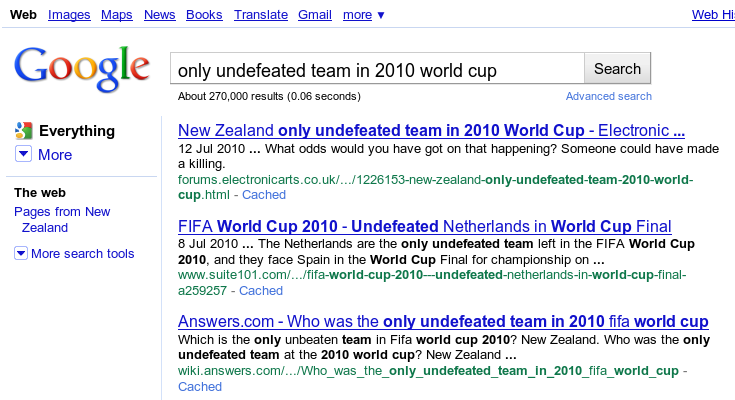 The extension can also be used to take screenshots on success, and includes a command to explicitly take screenshots. The screenshot extension project is on Github. You'll need to set the concordion.extensions system property to use it - see the README for details. The source code for this example is in the demo project. 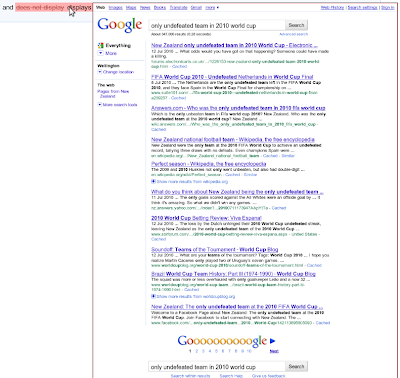 This extension was partly inspired by Mark Derricutt's ScreenshotCommand, and by Adam Setch's post to the Concordion list. Jan 03 2011. Project moved to Google Code and docs to Concordion site. What's happening in my acceptance tests? Agile Acceptance Testing allows us to describe desired behaviour using examples that describe the business intent. Good acceptance tests are written as plain language specifications, not scripts. Implementation details are coded in a separate test "fixture" class. One downside of this approach is a loss of transparency of what the tests are actually doing. The "fixtures" are often written by developers, which may need a leap in faith for testers to trust. On a recent project, this trust was dented when the tests didn't do what they were supposed to be doing. With this in mind, I set out to provide more insight into what our tests are actually doing, without undermining the principles of acceptance testing. This tooltip is proving useful not only to testers, but also for developers to gain insight into what is happening in their tests and to find performance improvements. For example, in the above example we were surprised to see the web page being loaded twice, and a number of element lookups being duplicated. This approach could also be used for user documentation of the steps required to complete an action, potentially with screen shots, or even as an embedded screen cast. We've added a new extension mechanism to Concordion 1.4.1 to make it easy to add features such as this. This extension is available on Github. The extension captures java.util.logging output and has a number of configuration options. You'll need to set the concordion.extensions system property to use it - see the README for details. For a example using this Concordion extension with WebDriver, see the demo project . Oct 26 2014. Updated links to new Github projects.